ELIZABETH CITY, NC –– The 2016 Dodge Durango brings impressive fuel efficiency to the table without sacrificing power. Best-In-Class available Horsepower and Towing rating with modern technology, plus an upscale interior is the 2016 Durango you’ll want to know. To learn all about this SUV download the 2016 Dodge Durango brochure below. The 2016 Dodge Durango seats an impressive seven passengers, towing everyone along with incredible power from the available HEMI engine underneath. This Durango feels like an SUV and performs like a muscle car. The exterior boasts athletic lines, a split-crosshair grille, and a bulked-up hood contributing to its overall powerful profile. The interior is upscale with ergonomic seating, lighted controls, digital gauge cluster, and Uconnect on the 8.4-inch touchscreen. In the back, passengers can enjoy tapping into the entertainment system independently with access to HDMI/USB ports and available Blu-ray/DVD System all on 9-inch screens. Contributing to it’s capability is the 60/40 split-fold-flat second-row reclining bench, 50/50 split-folding third-row seats, and a floor mounted mini-console with cup holders. 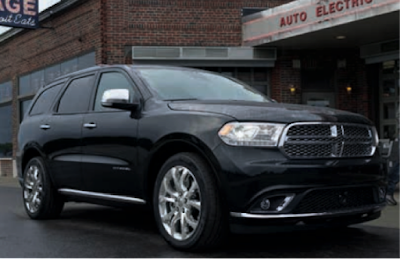 The 2016 Durango gives you a refined experience even in the worst conditions. The available AWD enhances traction and handling. AWD with the available V8 models uses a low range on the transfer case for extreme 4x4 situations. You’ll get up to an EPA-estimated 25 mpg highway. If power and capability are what you want in an SUV, stop by Perry Auto Group to purchase or lease your 2016 Dodge Durango. Perry Auto Group has two dealership locations to serve you better at 1005 W. Ehringhaus St, Elizabeth City, NC, 27909 or 1001 Halstead Blvd Elizabeth City, NC 27909. Stop in for any of your auto or community needs, or feel free to give us a call at (252) 338-9100.